The herringbone stitch, which is sometimes also called mossoul stitch, is worked along parallel lines in hand embroidery, creating a decorative border or edging. Herringbone stitch is frequently used in crazy quilting, working the crossed lines along the seams of the piecing. It's also used in shadow embroidery, because when worked on a sheer fabric, the stitches show through beautifully and give the stitching some dimension. It's also a great stitch to use in combination with other stitches. The gaps between the diagonal stitches are perfect for adding in running stitch, french knots or even tiny lazy daisies. 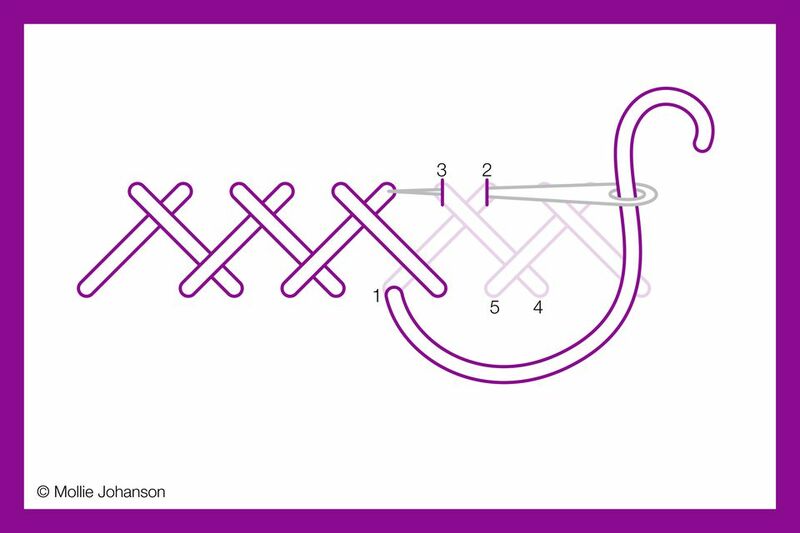 When working this stitch, mark parallel lines using a water soluble fabric pen or pencil, or count the threads in evenweave fabric to space the stitches. It's easiest to work this stitch on a straight line, but you can also work it on a gently curved line with the lines on the inside of the curve closer together. Working left to right, bring the needle up through the fabric at the lower left (point 1) and work a stitch diagonally to the upper right (point 2). Bring the needle up again to the left of the insertion hole (point 3), and then work a stitch diagonally to the lower right (point 4). Come back up to the left of this (point 5), which becomes the new point 1 so you are ready to repeat to the end of the row. Herringbone stitches can be worked closely together to form a dense line, or spaced further apart for a looser line. By changing the distance between the two lines you can also change the look of the stitch. Play around with the the height and spacing to achieve the look you want. Closed herringbone stitch uses the change in spacing to give it a whole new appearance. In this variation, each section of crossed lines touches the section of crossed lines before it. The result looks similar to double herringbone stitch, but this version is all in one color and requires only a single pass of stitching. A wider two-color band can be worked using the double herringbone stitch. To do this, stitch a second row of herringbone over the first, staggering the placement so that it fits in the gaps of the first row. When adding the second color, work one half of the stitch under the previous row of stitching, giving it a woven appearance. When worked densely, this variation resembles a braid. Tied herringbone stitch is worked first as a regular row of herringbone stitch. Next, add a small vertical tacking stitch at the point where the stitches cross. This can be in the same color or a contrasting thread. To work laced herringbone stitch, start with a row of basic herringbone. Using a second thread (typically in a different color), weave the needle so it passes under the diagonal stitches and over the point where the stitches cross. Originally written by Chery Fall and updated by Mollie Johanson.